A game called Lost in Harmony has been making the rounds on Google Play, adding up many positive reviews, with the game now currently sitting at a 4.6 star rating. 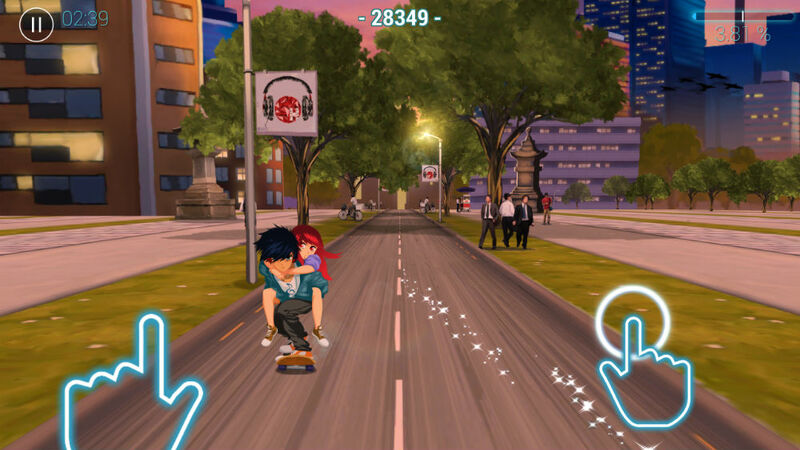 The story follows what appear to be two young lovers, riding a skateboard down many different roads. As you travel down these roads, you come across different obstacles you must steer away from, and if you time your musical taps correctly, the more points you will score. The game is entirely based on musical rhythm, so being able to hear it is very important. Because of this, headphones are recommended when you first start the game. While traveling through different sections of a chapter, the music changes, sometimes going down or up in tempo. As for the obstacles, given you are on a road, you will be passed by cars, motorcycles, and futuristic buggies. Naturally, the further you progress in a chapter, the more difficult avoiding obstacles becomes. While the gameplay is certainly neat, the shining aspect of this title are the graphics and music. The music is by no means original, although, alongside the gameplay, it can be a lot of fun to listen to. It’s very climactic. Lost in Harmony is completely free to download, however, players can purchase the full game as an IAP. The complete game is priced at $3.99. Check out the trailer below, and if you think you have the rhythm needed, go check it out. Question of the Day: How can the LG G5 Win You Over? Here is the LG G5 in Hand, Which LG Hilariously Refers to as "Rumored"